I’d use it for work when I’m home. I would have a blast working with all the photos I have taken of friends and family over the past years. It would make it easier to share them, too. I can’t wait! This notebook is beautiful, I love the sleek design and all of the features. As much as I’d like to keep it, I would give it to my mom, she’s disabled ans has problems using her arms for long periods of time. So the Touchsmart capability would be awesome for her! She could use the Touchscreen with ease, and not have to worry about using her arms for long periods of time by using a mouse to do everything. Also, the swiveling neck of the screen means she can use it in any way that would be comfortable for her. I’d be so thrilled to win this! Thanks so much. I have a small home business and this be wonderful for that. I am a homeschool mom and this would be great to help me organize. I would give it to my wife. She’s a high school teacher who could really use it! I would use it for school when I go in the Summer. I think it would be very helpful and easy to carry around. I would give it to my son who is starting technical school this summer. I’m a subscriber. I subscribed and I would use it when I am traveling. Probably will be shared by my wife - I suspect this design will really attract her - so I hope I get to use it for fun. I would absolutely love to have one of these. Thanks for the contest. This would be great when I travel. I would get caught up on my work If I win the HP Tablet PC. Thanks for the contest. This would be great to replace my old desktop computer! I would love this item as I sit at desk most of night lookig for coupons, doing research and learning. with thisI coul sit in den with everyone and be all together. Am an ardent sweepstaker and use email a lot to communicate with my 4 granddaughters so would definately use this. But besides that I am assisting my youngest son in getting his own business up and running and know this would be a super computer for that purpose as he will be going out to customers unstead of having them come into the shop and this would be a great travel companion. Leave it to HP to come up with something so fine as this. Fingers crossed here in the Poconos. I just subscribed! 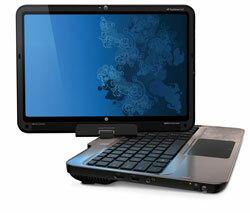 I would use the laptop to take with me on trips, it would be more convenient than the larger laptop I use at home. Thanks for the great contest! I have subscribed to the newsletter. I would love to win this computer! I’d use this to replace my outdated system and to keep in touch with family at home! This PC would replace my 10 year old antique. Everything an iPad can do… and so much more! I’m a subscriber…...I’d give it to my daughter…..she is always on the go and this would be so convenient for her to take along. I’m an injured seamen, living on an extremely limited income. When I shipped out, I placed all of my belongings in storage. When I shipped home, I discovered that almost everything had been damaged by water via a flood and a leaky roof. I can’t and won’t be able to afford to buy a new one. Every cent goes towards medical expenses. What would I do if I won the Touchsmart? I WOULD USE IT… EVERYWHERE! If I won this comupter I would use it everywhere in my house including like your picture shows in the kitchen pulling up recipes and fixing meals. What a great computer! If I won the computer, I would give it to my husband since we share one right now. I subscribe. I would give this to my mom. If I should win this, I’d use it to help build a business, maybe start writing some of those books I’ve been working on. If I won this wonderful HP, I would use it for everything, from using twitter, filling out giveaway forms, to facebook and my work at home office! i subscribed. if i won i would use it to replace my acer laptop that is falling apart. I subscribed. Since i am still using a desktop—this would be my lap top. It would be great to take outside on the deck. This would be the greatest prize since I do not have a laptop! I just subscribed. I would love to win this because it would be great for school. Thanks for the giveaway! Since I would have the touch smart I would probably touch it. I would also use it to do photography with. I subscribed and what wouldn’t I use this for! I’d love to try sketching on it and cooking in the kitchen with it would be a dream! Thank you! I would use it as my everday computer. My laptop is old and falling apart so I could really use a new one. lol Thank you!! This would be a Mother’s Day gift to me!! !